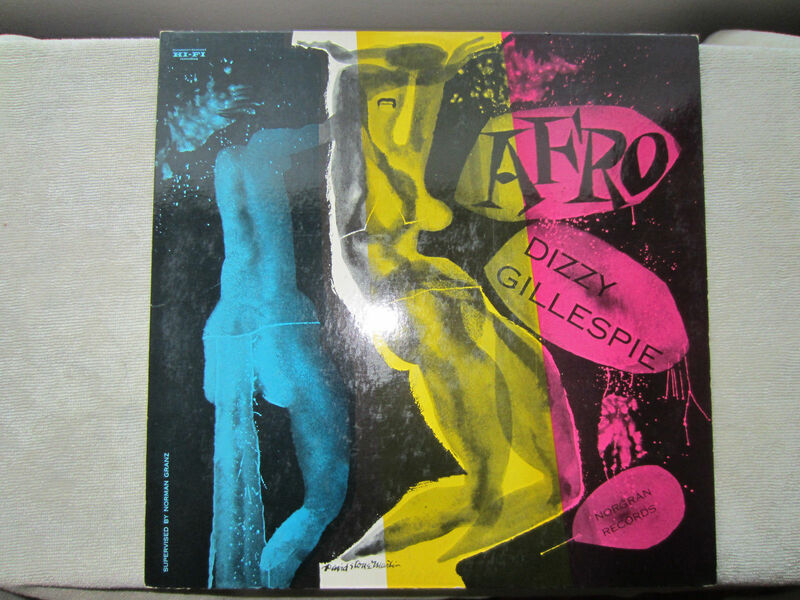 UP FOR AUCTION IS A RARE AND COLLECTABLE ALBUM BY DIZZY GILLESPIE TITLED "AFRO" RECORDED ON NORGRAN RECORDS. THIS IS THE ORIGINAL MONO PRESSING, 12 INCH DIAMETER, YELLOW/BLACK TRUMPETER DEEP GROOVE LABELS, LONG PLAYING MICROGROOVE, MGN-1003. THE RECORD IS IN MINT CONDITION (VISUALLY GRADED) THERE ARE NO MARKS, SCUFFS OR SCRATCHES ON EITHER SIDE, VERY CLEAN!, LOOKS ALMOST UNPLAYED. RANDOMLY PLAYED IT AND HEARD NO TICKS OR POPS, VERY LITTLE TO NO BACKGROUND SURFACE NOISE, STRONG SONICS. BOTH THE LABELS ARE IN NICE SHAPE. DIFFICULT TO FIND IN THIS CONDITION! THE ORIGINAL COVER IS IN STRONG VG++ CONDITION HAVING MINOR WEAR ON THE SPINE SEAM, SOME WEAR ON TOP SEAM WITH A 1 INCH SPLIT NEAR OPENING, LOWER SEAM HAS SOME WEAR WITH 1 INCH SPLIT AT OPENING, MINIMAL SURFACE WEAR ON FRONT/BACK. NICE DSM GRAPHIC ON FRONT. NO STICKERS, NO WRITING, NO STAMPS, NO WATER MARKS. ALL RECORDS HAVE BEEN CLEANED USING A VPI RECORD CLEANING MACHINE WITH VPI RECORD CLEANING FLUID. PAYMENT WILL BE BY PAYPAL ONLY. PAYMENT IS EXPECTED WITHIN 7 DAYS AFTER THE CLOSE OF THE AUCTION. THE SHIPPING COST IS THE RESPONSIBILITY OF THE BUYER AND CAN BE ESTIMATED BY REQUEST DURING THE AUCTION OR IT WILL BE DETERMINED AFTER THE AUCTION HAS ENDED. I WILL COMBINE THE SHIPPING COST FOR MULTIPLE AUCTION WINS. I SHIP WORLDWIDE, EXCEPT FOR NOTED EXCLUDED REGIONS/COUNTRIES. RECORDS TO BE SHIPPED OVERSEAS WITH A VALUE OVER $75 USD MUST BE SENT USING REGISTERED MAIL WHICH TYPICALLY ADDS TO THE COST OF SHIPPING BY $12-$15 MORE. THE RECORD WILL BE REMOVED FROM THE COVER FOR SHIPPING TO HELP REDUCE THE POSSIBILITY OF DAMAGE. ALL RECORDS WILL BE SHIPPED IN A STURDY RECORD MAILER CARDBOARD BOX WITH CARDBOARD INSERTS ON EACH SIDE OF THE RECORD/COVER TO HELP REDUCE THE POSSIBILITY OF DAMAGE DURING SHIPPING. THIS IS A PRIVATE LISTING AUCTION. I PROVIDE A "SATISFACTION GUARANTEED" OR YOUR MONEY BACK POLICY, LESS RETURN SHIPPING, IF YOU ARE NOT FULLY SATISFIED WITH THE RECORD. RECORD MUST BE RETURNED WITHIN 7 DAYS OF RECEIPT. ONCE RECEIVED AND IN THE SAME CONDITION AS SENT A REFUND WILL BE GIVEN AS MONEY BACK.